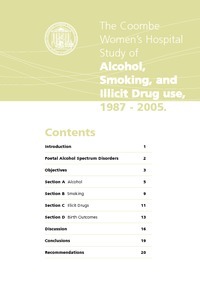 Home > The Coombe Women's Hospital : study of alcohol, smoking & illicit drug use 1987 - 2005. Barry, Siobhan and Kearney, Aoife and Daly, Seán and Lawlor, Elizabeth and McNamee, Emma and Barry, Joseph (2007) The Coombe Women's Hospital : study of alcohol, smoking & illicit drug use 1987 - 2005. [Dublin]: [Coombe Women's Hospital ]. This survey is the largest study of its kind ever conducted in Ireland, surveying over 120,000 pregnant women from 1987 - 2005. Statistics on rates of smoking, fetal alcohol spectrum disorders, alcohol intake, illicit drug use and birth outcome are presented. This study also includes conclusions and recommendations. Includes bibliographical references and tables.